There is so much joy in our Catholic faith and religion! Do you know someone who would like to know more about the beauty and joy of Catholicism? 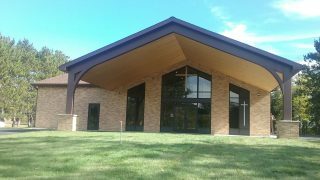 Classes for RCIA (Rite of Christian Initiation for Adults) will begin Thursday, October 26, at 6:30 pm, at Immaculate Heart Church in Crosslake (our sister parish in our cluster). The main purpose of this program is to provide education and information to those who are interested in becoming a Catholic; however, the classes are also for Catholics who want to learn more about their Catholic faith. Or, for those who have doubts about their faith and may have stopped going to church. Fr. Blake and Marilyn Lessard invite you to join them if any of the following apply to you: a) You have a desire to become Catholic; b) You were Baptized, but now want to be Confirmed; c) You just want to know more about our Catholic faith; d) You know someone who has an interest in becoming a Catholic; e) You have been away from the church and are considering coming back; f) You were not Baptized and now have a desire to be Baptized or are considering it. Contact Marilyn Lessard, Faith Formation Director for the cluster, at dre.marilyn@gmail.com or call 218-692-3731 for more information.